In today's constantly expanding world, consumers are continually searching for unique and varied options for their parties, events and festivals. Here at TukTuk Delight, we have the solution! 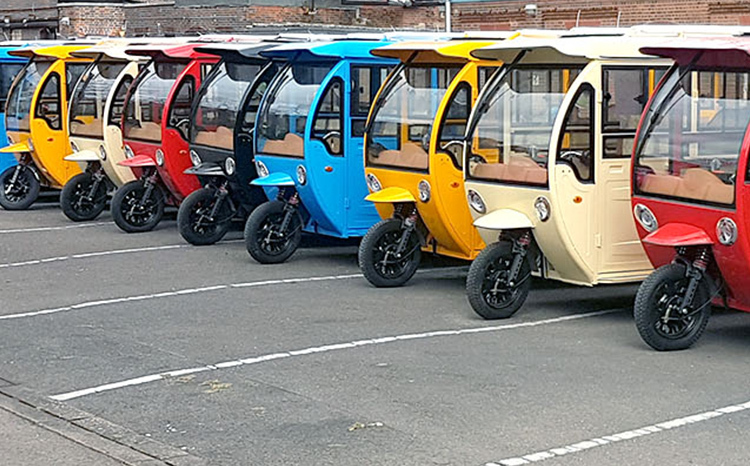 Make your event stand out from the rest with one of our fully converted electric Tuktuks. 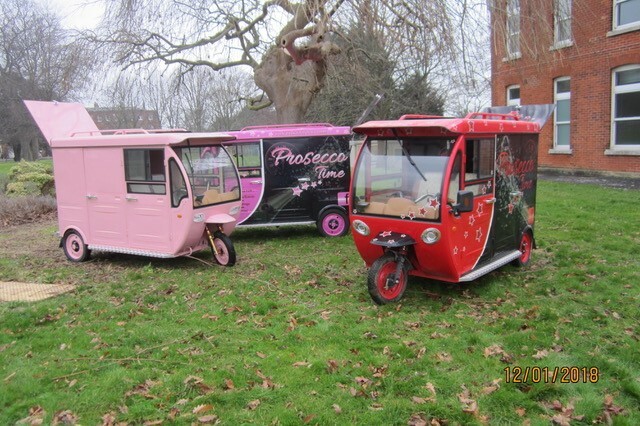 TukTuks are quickly becoming Britain's biggest craze when it comes to arranging an event. They are proving so popular at a wide range of events like weddings, hen/stag parties, hotel receptions, airport lounges, themed events, corporate promotions, sporting events and many more. 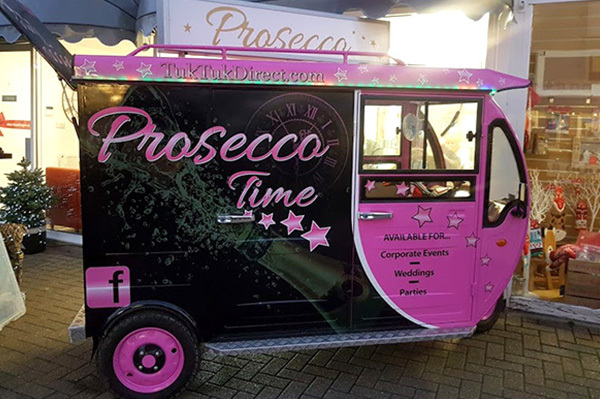 Our unique Prosecco Time TukTuks are a welcome delight to any wedding reception. We offer a variety of packages which include the 'Serve Yourself!' option, which is proving so popular amongst our clients. The wedding couple goes first, and all the other guests queue behind and serve themselves makes for some wonderful wedding shots! You can lease these exciting vehicles to add an extra edge to your event at affordable prices. TukTuk Delight is one of the largest providers in the UK. Check our hire page for more details. Or, contact us for more details. In today's constantly expanding world, consumers are continually searching for unique and varied options for their parties, events and festivals. Here at TukTuk Delight we have the solution! Tuktuks are quickly becoming Brittain's biggest craze when it comes to arranging events. They are proving so popular at a wide range of events like weddings, hen/stag parties, hotel receptions, airport lounges, themed events, corporate promotions, sporting events and many more. 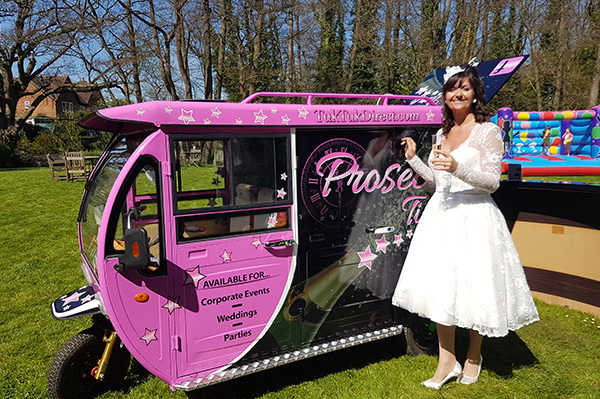 Our unique Prosecco Time TukTuks are a welcome delight to any wedding reception. We offer a variety of packages which include the 'Serve Yourself!' option, which is proving so popular amongst our clients. The wedding couple goes first, and all the other guests queue behind and serve themselves makes for some wonderful wedding shots! Check our hire page for more details. In today’s constantly expanding world, consumers are continually searching for unique and varied options for their parties, events and festivals. Here at TukTuk Delight, we have the solution! 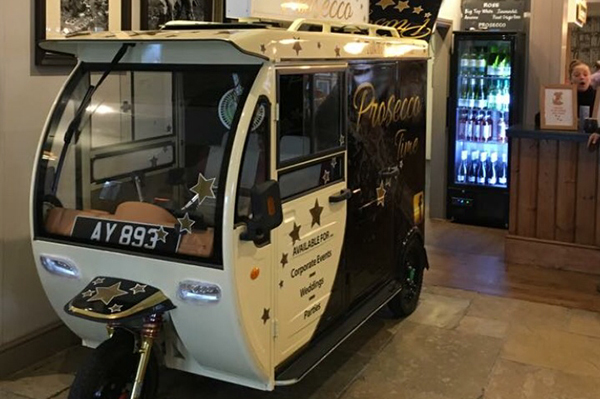 TukTuks are quickly becoming Britain’s biggest craze when it comes to arranging an event. They are proving so popular at a wide range of events like weddings, hen/stag parties, hotel receptions, airport lounges, themed events, corporate promotions, sporting events and many more. We offer a variety of packages which include the ‘Serve Yourself!’ option, which is proving so popular amongst our clients. Check our hire page for more details, or contact us for more details.